“Unnecessary rules handed down by unelected Washington, D.C., bureaucrats that violate agreements going back to the 1950s threaten the future of mining and economic development in Minnesota. After visiting the operation and meeting with stakeholders in Northern Minnesota, I understand this project's value to our country and our economy. I ask Secretaries Zinke and Perdue to honor long-standing agreements between the federal government and our citizens by lifting these last minute rules handed down by the Obama Administration, allowing Americans to continue investing in jobs, economic development, and education,” remarked Congressman Westerman. Today, Congressional Western Caucus Chairman Gosar (AZ-04), Chief Forestry Officer Rep. Bruce Westerman (AR-04), Caucus Member Tom Emmer (MN-06) and Rep. Rick Nolan (MN-08) led a letter signed by 26 Members of Congress calling on Secretary Zinke and Secretary Perdue to rescind a 234,328-acre mineral withdrawal application and renew two improperly terminated leases. Signers of the letter include: Representatives Mark Amodei (NV-02), Andy Biggs (AZ-05), Ken Buck (CO-04), Kevin Cramer (ND-AL), John Culberson (TX-07), Warren Davidson (OH-08), Scott DesJarlais (TN-04), Jeff Duncan (SC-03), Tom Emmer MN-06), Trent Franks (AZ-08), Bob Gibbs (OH-07), Paul Gosar (AZ-04), Mike Kelly (PA-03), Doug LaMalfa (CA-01), Doug Lamborn (CO-5), David McKinley (WV-01), Alex Mooney (WV-02), Rick Nolan (MN-08), Steve Pearce (NM-02), John Shimkus (IL-15), Glenn Thompson (PA-05), Scott Tipton (CO-03), Daniel Webster (FL-11), Bruce Westerman (AR-04), Ted Yoho (FL-03), Don Young (AK-AL). 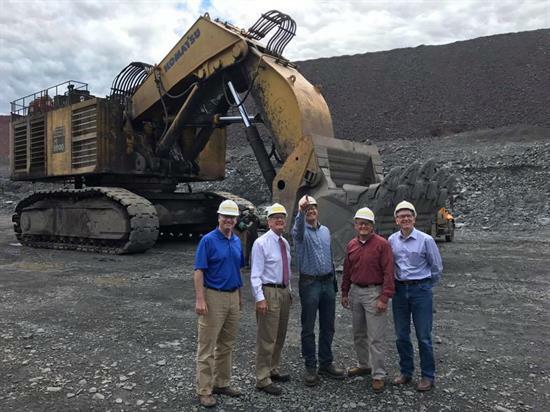 Last week, Reps. Gosar, Emmer, Westerman and Nolan toured several mining operations, held a stakeholder meeting and visited the proposed federal withdrawal area adjacent to the Boundary Waters Canoe Area Wilderness outside of the city of Ely, Minnesota. The comments they heard on the ground from American families, businesses and individuals who want these jobs and support these mining projects led to this effort. On January 5, 2017, the U.S. Forest Service (USFS) proposed a 234,328-acre federal mineral withdrawal of National Forest System (NFS) lands, for a 20-year term, within the Rainy River Watershed on the Superior National Forest, immediately placing this vast area off limits to development for up to two years while the withdrawal is considered. The total withdrawal application boundary spans approximately 425,000 acres, including 95,000 acres of state school trust fund lands. To date, Twin Metals has reportedly invested upward of $400 million – a significant investment – in reliance on two federal mineral leases that the BLM executed with the company's predecessors and renewed each time they expired. According to Twin Metals, BLM’s refusal to renew the leases was based on a March 2016 opinion by the then-Solicitor of the Department of the Interior, concluding – based on flawed legal analysis - that BLM had the discretion to deny the renewal of the mineral leases. In addition, Minnesota’s Constitution mandates that state trust lands ensure a long-term source of funds for K-12 education. In fiscal years 2014 and 2015, revenues from state mineral leases derived from school trust lands in Minnesota totaled $51.6 million and $36.8 million, respectively. All told, Minnesota is projected to lose up to $3 billion in royalty revenues for the State’s Permanent School Trust Fund that would support nearly 900,000 K-12 students statewide if the withdrawal application and cancelled leases are not rejected by the new administration. Environmental stewardship and positive economic growth are not mutually exclusive. Our members We support regulations that ensure environmentally-responsible mining in order to protect water quality and preserve the scenic beauty of the Boundary Waters area, where significant buffer zones already exist, including areas created by the BWCAW Act and the Minnesota Outdoor Recreation Act. Furthermore, any new mines proposed in the region will have to undergo, and adhere to, strict mandates and requirements under the National Environmental Policy Act (NEPA), state laws and other regulations. Unfortunately, the environmental study affiliated with the withdrawal pre-empts this comprehensive review from taking place, blocking the opportunity for a project to even be considered.